For a lot of us, Labor Day is the last hurrah for summer and a sign that fall is on its way. But a lot of times we forget that we still have 3 more weeks of summer so let’s not throw our sandals into storage just yet! We are still looking at 90° weather over the next week or so. I would say summer is still alive and kicking! While so many are already sipping on their Pumpkin Spiced Lattes, some of us are not ready to let go. Trust me, fall is my favorite season by far, but I still want to savor the last bit of summer or at least milk it for what it’s worth. But what I am ready for right now is roasting season. I love a big pan of roasted root veggies and the butternut squash in the garden should be ready just at the right time: fall! But you know what? Summer time is still just as great for roasting veggies and even fruit. Peaches are the sure sign that summer is still juicy as ever. And if summer’s going down, well then this is exactly the way I want it to be; with this Maple Roasted Peach, Quinoa + Spinach Salad. 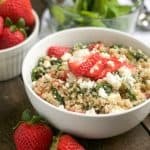 If you have someone in the house who isn’t quite on the quinoa bandwagon yet, this is the perfect way to introduce it. 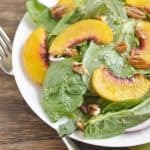 The quinoa takes a subtle note to the flavor of the juicy roasted peaches, citrusy balsamic and toasted pecans. 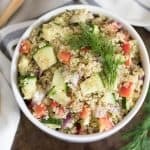 Did someone say quinoa? Exactly. You forgot already. So don’t let summer go just yet. Grill a nice piece of salmon and serve it over rice and enjoy this salad right along with it as the sun sets on the patio. Sorry fall, we just aren’t ready for you yet. Halve peaches and remove pits. Slice into 1/2 inch slices. Toss peaches in coconut oil to coat evenly. Arrange peaches in a single layer evenly on a baking sheet lined with parchment. Roast for 15 minutes flipping halfway through. At the end of 15 minutes, remove pan and brush peaches with maple. Place back in oven and heat for another 5 minutes. Remove from oven and grind sea salt lightly over peaches. Place pecans on pan and heat for about 5 minutes to toast. While peaches are cooking, toss together onion, quinoa, and spinach or greens. 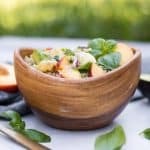 Add peaches to the salad and toss to mix. Dress and toss to coat using desired amount of dressing. You can wait to dress the salad until serving as well!